IN his continuing search for the more weird, whacky and wondrous in the world of travel, David Ellis says if you reckon you deserve a bit of regal service on that next holiday, book yourself into the Taj Lake Palace at Udaipur in the state of Rajasthan in Western India, and play at being one of the country's maharajahs of old. 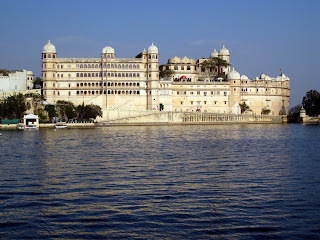 This hotel occupies the entire one-time palace of Rajasthan's maharanas (known as maharajahs in other parts of India,) being built in 1746 by Maharana Jagat Singh II, and occupying all of a 1.6ha (4-acre) island in the middle of Lake Pichola. You'll have a choice of Luxury Rooms, Palace Rooms or Royal Suites – with Royal Butlers who are descendants of the original palace retainers on hand to ensure your every creature comfort. And while it's got all mod-cons for today's tourist from world-class local and international dining to a spa that features ancient Indian techniques, its old-world ambience and privileged lifestyle is enhanced all the more when you call for some transport to get you into town: after a short boat ride to the jetty, you can have a vintage or classic car take you shopping or sightseeing.